Last week I started a list of the eleven signs we own too many things. This week I’m continuing the list with another eleven. Stay tuned for another eleven next week. We have good jobs, but live paycheck to paycheck. If we have a good income but live paycheck to paycheck, we own too many things. We have multiple of something but only use one or a few of our favorites. This is how I recognized that I could reduce my clothes. I had a lot of clothes that I never wore because they weren’t my favorites. If we have multiple copies of something but we always choose a specific one because it is our favorite, we own too many things. We have things and we don’t know where they are. If we have things that we can’t locate, we own too many things. We spend more time looking for things than using them. If it takes us longer to find something than it does to use it, we own too many things. We have things that roam our house because they don’t have a normal resting spot. If we have things that don’t have their place and just get moved from one place to another place, we own too many things. We have more trash than we can put on the curb each week. If we have so much junk that we wouldn’t be able to put it all at the curb for one trash pickup, we own too many things. We have bought things and then had buyers remorse. If after we buy some things we realize that we didn’t really need or want it, we own too many things. We feel like we need a bigger fortress to store and protect our things. If we feel like our home isn’t big enough to store all of our things, we own too many things. We have things that someone else would appreciate more than we do. If we have things that others would take care of and appreciate more than we do, we own too many things. We have things that keep us from the things we enjoy. If we have things that prevent us from enjoying life, we own too many things. We have things that have taken on a decorative purpose, but they weren’t intended for that. If we find ourselves trying to turn non-decorative items into decorative items, we own too many things. 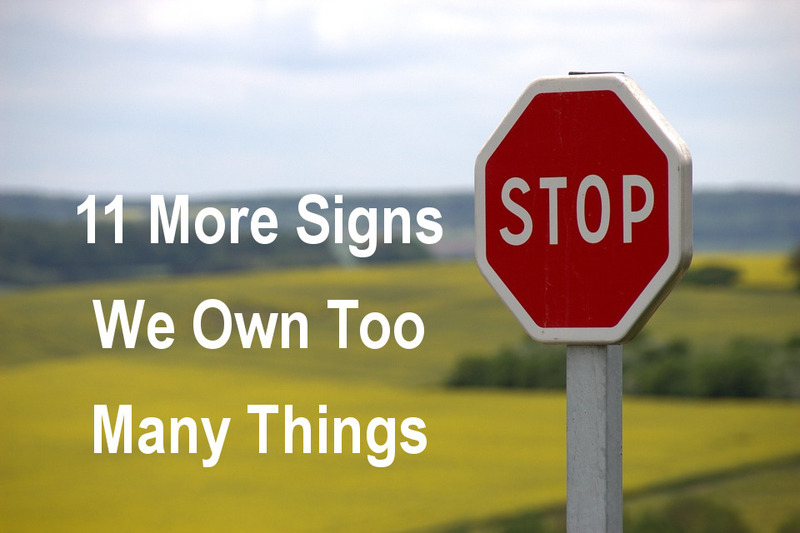 Post below to share more signs that we own too many things. “Easiest Way to Organize Your Stuff | The Minimalists.” The Minimalists, August 5, 2014. http://www.theminimalists.com/junk/. “Free Image on Pixabay – Stop, Shield, Traffic Sign.” Pixabay. Accessed February 12, 2017. https://pixabay.com/en/stop-shield-traffic-sign-road-sign-634941/.